Mosaic Clubhouse, (Living Well Partnership hosts) has clinched a national award in the Charity Governance Awards, an exciting new not-for-profit initiative created to celebrate outstanding governance in charities both small and large. 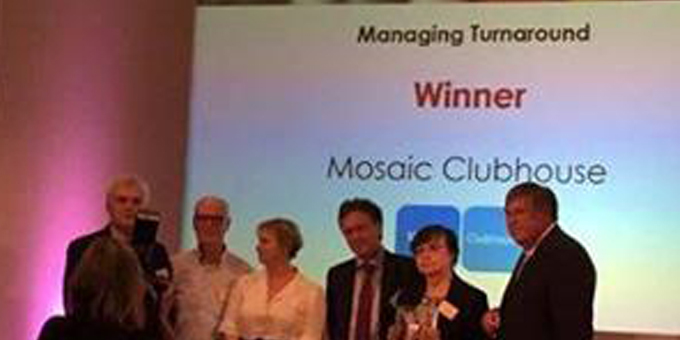 Mosaic won the £5,000 Managing Turnaround category in the awards, sponsored by The Clothworkers Company (the categories focused on impact, board diversity, turnarounds and harnessing risk). Maresa Ness, Chief Executive said judges were highly complimentary and highlighted commissioners and partners’ support, which had grown the Living Well Partnership. The award she said reflected the hard work and support of Clubhouse trustees. Mosaic is not shy of awards – last year Maresa won the prestigious COLLABORATION (INTEGRATION) AWARD in the Third Sector Care Awards, organised by CMM (Care Management Matters) and presented by Esther Rantzen. This followed Mosaic’s international Clubhouse community being awarded the world’s largest humanitarian award, the Conrad N. Hilton prize worth 1.5 million dollars, presented to organisations that are doing extraordinary work to alleviate human suffering.